Nobody likes to be out of style and in Derby (Derbyshire) is very easy to feel cool and trendy thanks to the many fashion wear offered all around the country. There is a wide range of clothes shops in Derby (Derbyshire) that will satisfy your needs and tastes beyond your expectations and within your budget. 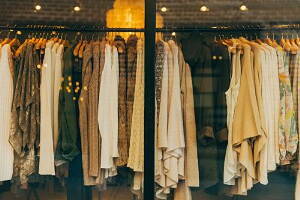 Thanks to Infoisinfo, you will be able to find the best clothing stores that better fits you. In fact, you could easily find plus size clothing or petit clothes in different shops. You might want to stand out of the crowd and get the most fashion dress from clothes designers to feel that you are one of a kind, and different boutiques will provide you with the best outfits for ladies. Do not forget that the perfect look needs of nice clothing accessories and the right choice of footwear. On the other hand, much more affordable woman clothes, casual shirts and the best clothing stores for men are also all around Derby (Derbyshire). Metallic dresses and skirts for partying and evening meetings. Stripes dresses, trousers and shirts. Vertical ones will stylize your figure. Floral prints. They are a must even onto jeans during spring. Khaki colour is the most trendy one. Do not doubt it and incorporate different clothes to your wardrobe. Pop art prints: ideally for skirts during summer. At Infoisinfo we work hard to offer you the best solutions whatever your needs are. If you are looking for trendy clothes for woman and men, this is your directory. We’ve prepared a list with the best clothing stores and supplies in Derby (Derbyshire) among which you will be able to find the perfect place to buy new clothes for you or baby and children clothes for your kids. Have a look at the contact details provided such as phone numbers, address and opening times, as well as comments and valuations from other fashion lovers. Enjoy shopping!